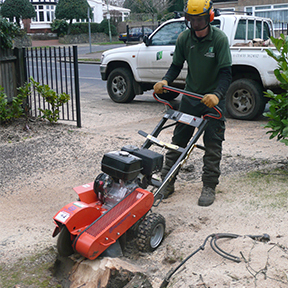 When trees are removed they can be felled to a low level or the stump can be removed. Stumps can be left at different heights for wildlife habitats, to put potted plants on, cut to ground level and also treated to stop re-growth. However, the stumps can also be ground out. If the stump is in a lawn or flowerbed it can limit the use of the ground. It can’t be built on or turfed over so can be removed using a stump grinder.